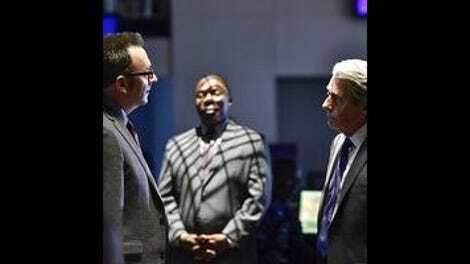 As the penultimate episode of the series, “.exe” is a tricky episode of Person Of Interest. It immediately poses as a “what if?” episode in the style of It’s A Wonderful Life, and while Person Of Interest is the type of show that could pull off going through with an It’s A Wonderful Life-style episode in its penultimate episode… Well, it would at least be a little disappointing if that were the lead-up to a one-hour series finale that would then have to cover so much ground. And this is even keeping in mind that “If-Then-Else,” arguably the best episode of the series, is essentially a “what if?” episode. But the It’s A Wonderful Life approach to that trope can both make for memorable television and a logic-bending episode. It would be a risk, on multiple levels, for Person Of Interest to take, even with the concept of a nearly omnipotent machine running the scenarios. Instead, Person Of Interest takes all of those assumptions about what “.exe” will be like from that very first “what if?” simulation and decides to flip them on their head. (Plus, have we not all gotten our fix of deeply intensely simulations this season?) 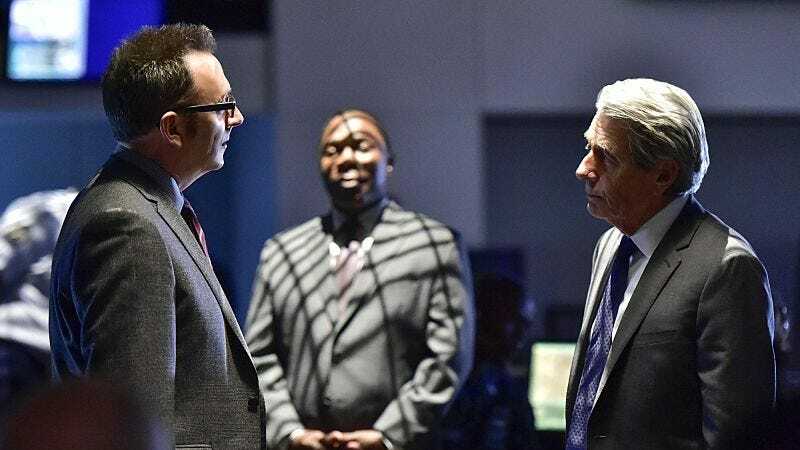 The “what if?” simulations are still a part of the bigger decision, but unlike most versions of this story, Person Of Interest doesn’t make it easy to lean in one direction or the other. These simulations don’t address the irrelevant numbers that the Machine wouldn’t be around to help, but based on Greer’s report to Senator Garrison, crime is way down (the Fusco scene also confirms that—though there’s a higher number of missing persons), but things like education and employment are up. People are safer, and better yet, people the audience loves are alive. It’s not so black or white through that lens. But at the same time, it really is. Because in all this “what if?,” the answer to the question is still the same answer it’s always been: All that matters is the greater good. If it didn’t, Reese and Shaw wouldn’t be playing “Where In The World Is Harold Finch?” and hopping back and forth between New York and Washington D.C., now would they? Sure, the world can go on without the Machine, as much as that stings, but the world literally cannot go on with Samaritan. While it may look good for awhile, that’s all just window-dressing. In fact, while Finch, Reese, and Shaw are at Samaritan’s shiny headquarters, it’s Fusco mucking around in the dirt of what Samaritan’s operation really means for the world. While this season’s missing persons storyline isn’t exactly the most interesting one—especially in the context of this being the end the end of the series—“.exe” works the its magic to at least make it really mean something in the larger scheme of things. It’s not a particularly intriguing plot compared to the rest of the episode, especially with the ticking clock on the virus and Reese and Shaw catching up to Finch. And the knowledge that Agent LeRoux is the Samaritan cleaner who dumped all those missing persons in the tunnel isn’t exactly a gamechanger. But with all of the “what if?” simulations, it’s the Fusco one that truly leaves a mark on the episode when put side-by-side with his role in this episode. Fusco is secluded in this episode, but his work with and in Team Machine has taught him how to fend for himself for the cause. The Finch/Reese/Shaw side of things, on the other hand, shows just how much they now need to work together—while Finch’s plan is practically flawless, he’s dead without Reese and Shaw being alerted by the Machine (especially to turn the wireless modem on). Shaw’s dead without Reese literally watching her back. And, well, we saw how Reese is dead. So the man who couldn’t stand on his own two feet against police corruption at the beginning of the series is now taking down Samaritan agents by himself, while the loners would find themselves in complete peril if they didn’t have each other. And while this particular mission of Finch’s may have started from a place of hurt and mourning, “.exe” makes it clear that ultimately, every extreme thing Finch has done to get to this point really was for the best; and the same can be said for the eventual aftermath of unleashing the Ice-9 virus on Samaritan. A lot of other things will be destroyed in the process, but in terms of the greater good, it’s all worth it. If there were an easy fix that didn’t destroy the internet or the Machine along with it, Finch would obviously prefer that, but this episode makes it clear that an 11th hour godsend isn’t coming. This is war, as Team Machine keeps telling us, so of course it’s messy. And it only gets messier in the aftermath of war, which is what Person Of Interest has set up for the series finale. And it will supposedly do so without its human Big Bad, Greer. Before his demise, “.exe” makes it very apparent that, while Greer can obviously read Finch, he truly underestimates the Machine. In his mind, the Machine is simply a flawed version of the superior Samaritan, just as irrelevant as the numbers it helps. It’s a feeling of superiority that’s slightly hypocritical, considering his classification of the Machine as a god as well; but at the same time, Greer basically feels like his god is better than Team Machine’s god, and that’s the only justification he needs. Still, he can read Finch perfectly and call out that the dark look doesn’t suit him. Because, let’s face it, Finch is never going to be a Greer-like figure, which is supposedly his flaw (according to Greer), as that also means he doesn’t have complete trust and faith in the Machine. But Greer doesn’t take into account the inverse being true: The Machine has complete trust and faith in Finch. Greer approaches this entire situation like a chess game, ignoring the outlier that the Machine has become. “.exe” does quite a bit of stretching to get the audience on board with the idea that there’s a chance the Machine both has no idea what the password to activate Ice-9 is (as Greer and Finch both believe) or that Ice-9 will destroy take it down just like it will Samaritan. So when it’s revealed that it does know these things, after Greer has already lost by being multiple moves behind it, the episode also confirms what the Machine has been taught to appreciate and what Samaritan will only suppress (making things so much easier in Finch’s decision): choice. The Machine refuses to make Finch’s choice on this matter for him, and everything the Machine does with Reese and Shaw is only a means to ensure that Finch is still able to make whatever choice he must. As I pointed out last week, the Machine understands the human condition better than most humans, and neither Greer nor Samaritan factor that into (nor can they) this equation. This is a safe space, so I’ll inform you all that Finch saying “Who am I?” made me react by reciting the rest of the Gossip Girl line. What I’m saying is: Finch would have been a better Gossip Girl than the actual Gossip Girl, and it’s probably safe to assume that’s what Person Of Interest is going for in the series finale. You heard it here first. I know it’s not the series finale yet, but this episode feels like as good a time as any for me to say that the greatest trick Person Of Interest ever pulled was casting Brett Cullen as Nathan Ingram and never making him a secret baddie. I wish there were more of Shaw mocking Reese for his claustrophobia. I understand that they were on a time crunch, but… We could’ve had more of Shaw mocking Reese for his claustrophobia! Person Of Interest’s fifth season really has been Fusco’s coming-out party, and Kevin Chapman is killing it. Because Fusco is essentially comic relief—and he’s definitely an average Joe compared to the rest of the team—I feel like his character arc and growth aren’t really given as much attention as they often should be when discussing the show. But it’s there, and this is the perfect episode to compare what is and what should never be with that character. The worst part about Greer’s death is that Shaw didn’t get to do it herself or at least be present. But at the same time, it’s not exactly unexpected that Greer winds up dying in an act of passion for Samaritan. The zealotry that Greer has for Samaritan could only end in tragedy.